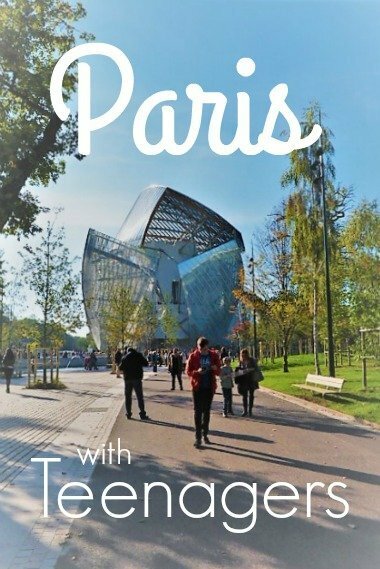 Inspired by a blogging friend asking for tips on what to do in Paris with teenagers I took the brief seriously and got to work asking all the teens I know in Paris for ideas. You see we used to live there, in the city that’s “always a good idea” to quote Audrey Hepburn; we lived in Paris for 10 years but we lived there as young newly weds, as young new parents and through until our first born, now a teenager, and referred to in this blog as the Teen, was 7. 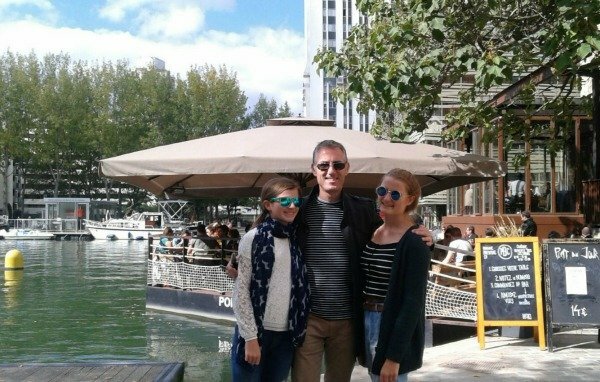 Our personal experience of Paris for littlies is extensive but Paris with teens is limited. However, having lived there for so many years we have plenty of friends with similar aged kids as ours and know a great many Parisian teens. La Grande Epicerie – the food halls of Paris’s oldest department store le Bon Marché. Organic market on Bld Raspail on Sundays. 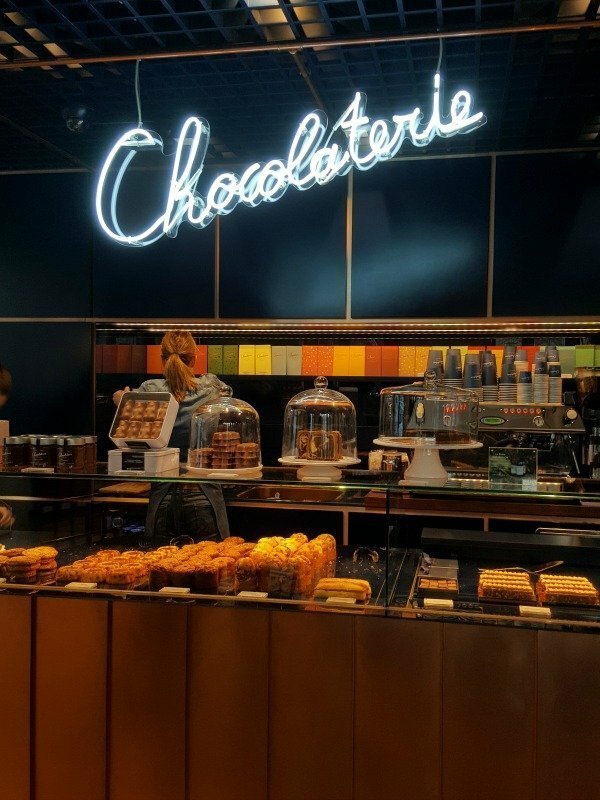 La Chocolaterie Cyril Lignac – chocolate café from a Michelin starred TV chef. Ober Mamma – delicious Italian food in trendy Oberkampf quarter. Five Guys – US burger chain, the one on the Champs-Elysée is the biggest in the world. It may not be where you imagine eating on the most famous of Parisian avenues but honestly the Champs-Elysée is over run with fast food joints so you might as well indulge the teens with this one. 49-51 Ave des Champs-Elyées. Have a picnic! Grab a baguette, some cheese, charcuterie, chips and more from a local market/supermarket and find your perfect spot. For ideas of top locations check out this guide. Paname Brewing Company – on the basin de la Villette, good for after/before hiring a canal boat…. *Fun fact: did you know Paname is a nickname for Paris? It’s very commonly used in regular speech. Les Buttes-Chaumont – a lesser known park, with very few tourists and good views over the city. 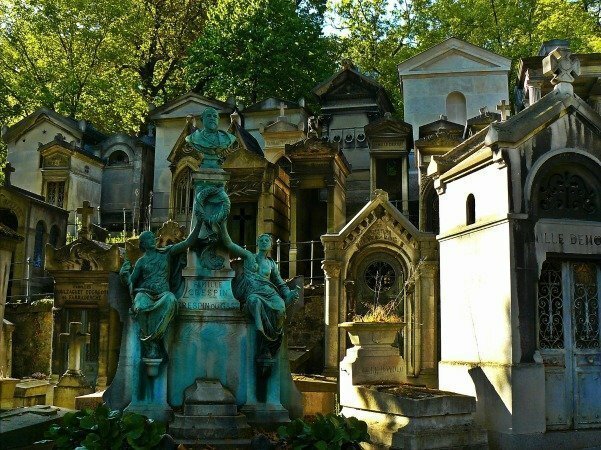 Père Lachaise cemetery – many famous people buried here including Jim Morrison, Oscar Wilde and Chopin. Rue Rambuteau, rue Berger, rue Montorgueil around Les Halles for drinks. Jussieu for drinks in a student area. La Villette – canals, museums, park, open space. The “je t’aime” wall. 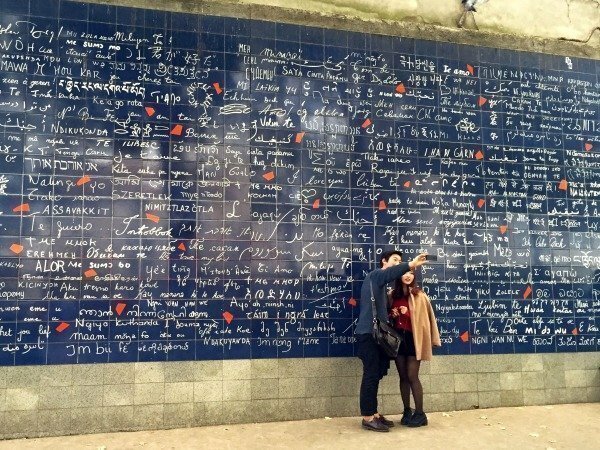 250 languages saying “I love you” on a 40 m2 enamel work of art located at Square Jean Rictus, Place des Abessess. Citadium – 6000 m2 of the latest streetwear located behind les Grands Magasins (Printemps & Galeries Lafayette). 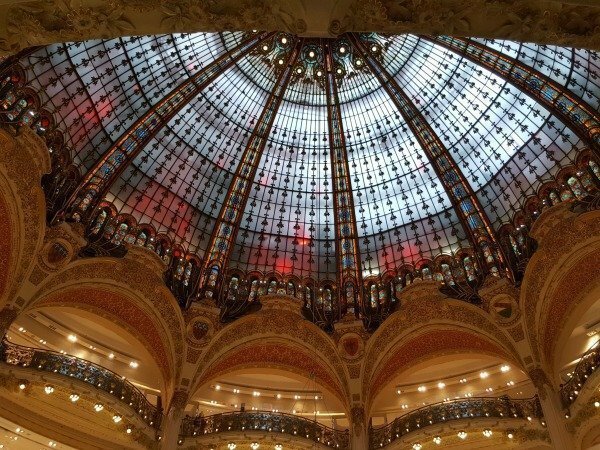 Galeries Lafayette Haussmann – department store worth visiting for its beautiful stained glass dome as well as its fashion, shoe and beauty departments. Châtelet and the Marais for “friperies” (secondhand/vintage clothing stores). Supreme store – mythical New York skate/hip-hop store. Shakespeare and Company – legendary bookshop for English language & second-hand books, a Paris institution, open in this location on the Left Bank since 1951. Tea is served every Sunday at 4pm with discussions on literature. Rent Velib’ bikes (the almost free city bike share scheme) for a fun and liberating way to get around, but if not confident enough then take a cycle tour. **Update Jan 2019, the Velib scheme has had many problems over the past year and may not be functioning as well as it used to. 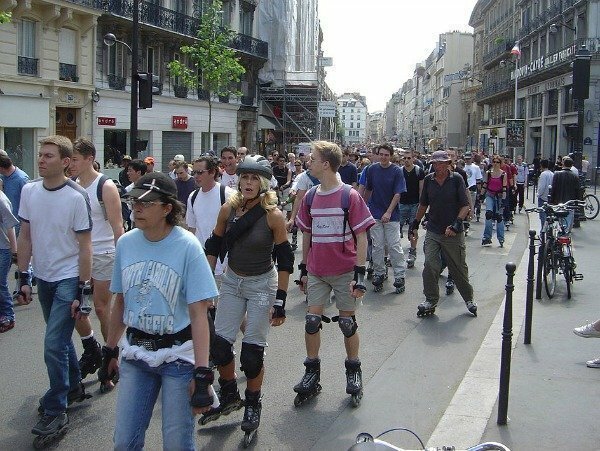 Go rollerblading with thousands of other people on Friday nights at 10 pm for a 3 hour exhilarating speed through the streets of Paris with Pari-Roller. Or without the gang along the banks of the Seine on Sundays when the road is pedestrianised. There are places to rent rollerblades near Bastille. Rent an electric self-drive boat on the Canal de l’Ourcq or Canal St Martin. Take a Segway tour as a fun original way to see Paris. 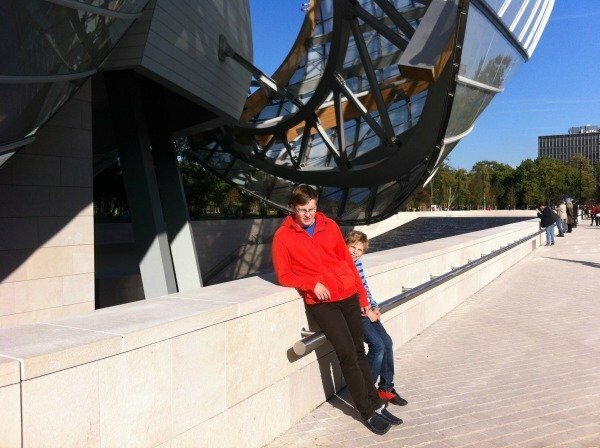 Fondation Louis Vuitton – ultra modern building designed by Frank Gehry in the Bois de Boulogne housing a contemporary art museum. Go for the exterior even if not interested in the art inside (photo at the bottom of post for the Pin shows its unique shape). Musée de la Mode et du Textile – fashion and textiles museum with changing exhibitions, in the Louvre building. 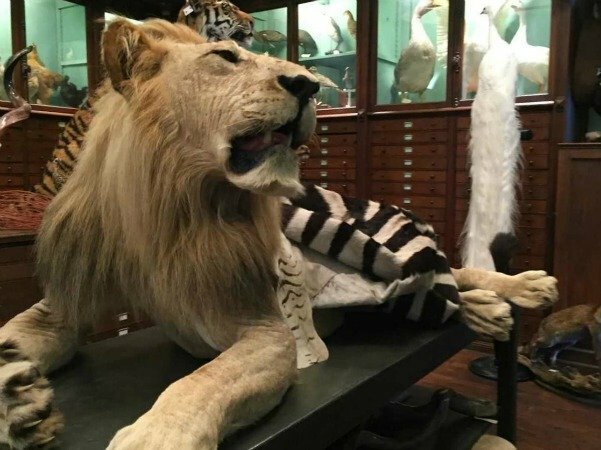 Deyrolle – legendary taxidermy shop, full of stuffed animals and curiosities. Being a shop it’s free to enter and quite bizarrely fascinating to look around. Tends to appeal to teens’ sense of the macabre! 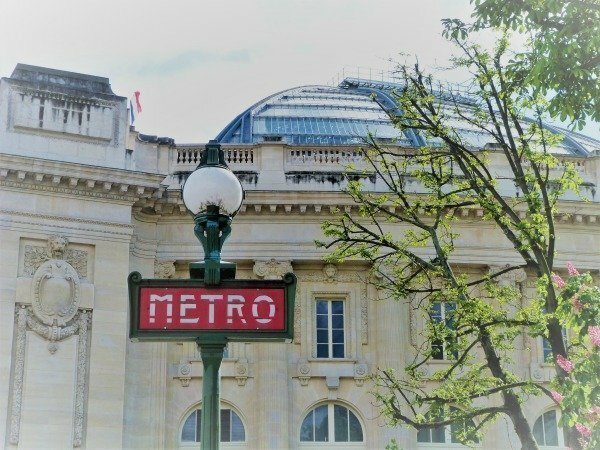 Musée des Egouts de Paris (sewers museum) – yes you really get to walk around in the Paris sewers, which are bigger, more interesting and less smelly than you might think! Musée du Quai Branly (museum of art and civilisations of Africa, Asia, Oceania and the Americas) – interesting living wall and gardens as well as permanent collection in another spectacular architect designed building (Jean Nouvel). 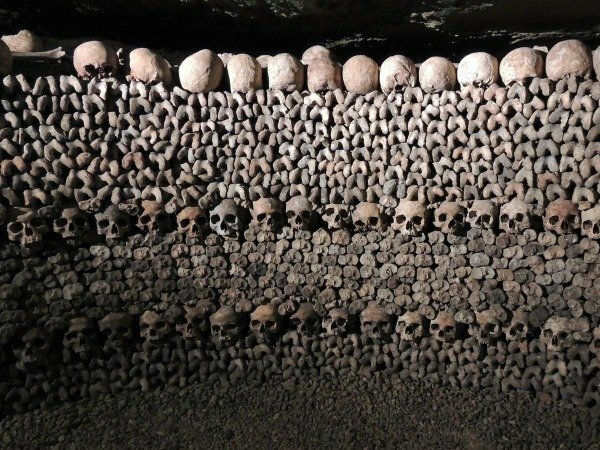 Catacombs – an underground warren of bones and skulls removed from overflowing cemeteries in the 13th century. Need to book and go early as queues get huge. TOP TIP! Always carry a Student Card as many (most) historical buildings/museums are free/reduced for students, particularly from the EU. A passport/ID is not enough, it really has to be a student card. My first trip with friends only, no parents involved, was to Paris for a week aged 16. I went with two friends from school, we took the ferry and train from England, stayed in a beautiful apartment on Bld St Michel, walked our little feet off and loved every minute of Paris as teenagers. I’ve never forgotten that week, it was my first truly independent adventure. 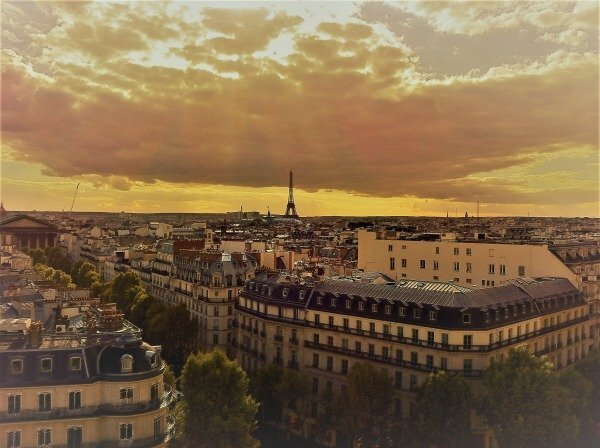 I could never have imagined then that I’d end up living there many years later and that my own children would be born in Paris. It’s one of the most special places on earth for me and I hope other travelling teenagers can capture even just a smidgen of my passion for it. 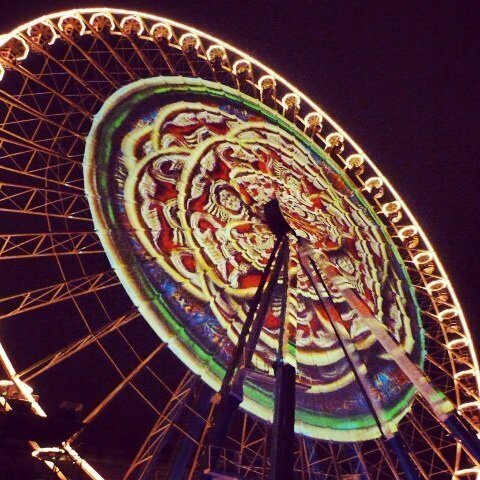 Paris is always a good idea! With special thanks to all our lovely Paris friends for so many great ideas: Ella, Lily, Christine, Cameron, Kate, Ann, Gabriella, Jo, Louis, Yacine, Lucas, Natasha, Julie, Hugo, Martin, Felix, Valérie, Tony, Emile and Camille, you rock! Have you been to Paris with teenagers? Please add your experiences and suggestions in the comments. Wow I am so happy I stumbled across your post! I am taking my daughter 10 and her best friend 11 in 3 weeks to Frace for 16 days.7 of those days will be in Paris and I was wanting some fun regular stuff to do! Have you ever gone to the Leonardo Di Vincenci home/ garden? That sound fun but not sure? What a great post. We are off to Paris to shop for stock for our Berlin store (with our teen) I’ve added many of the tips to a personal Google map on my phone, which is an easy way to carry lots of info around town- (!but not something you check on the street!) Many thanks. 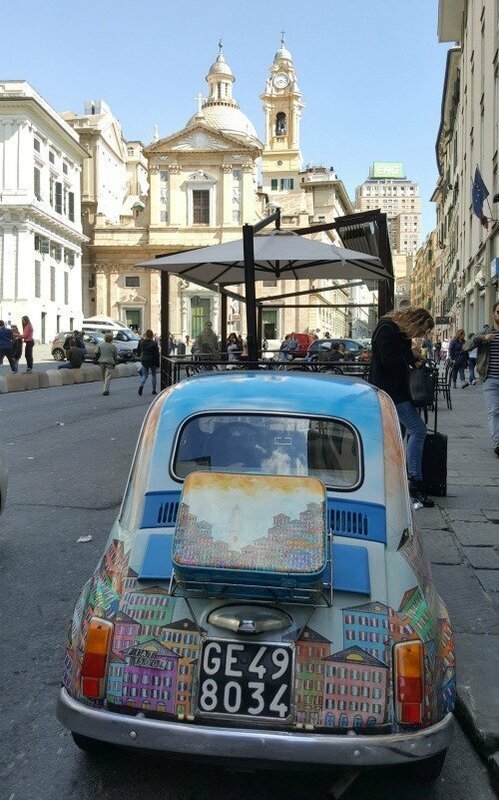 Great blogpost Phoebe, will definitely add some extra fun to our trip to Paris. Eat and stroll! Paris by night is lovely. 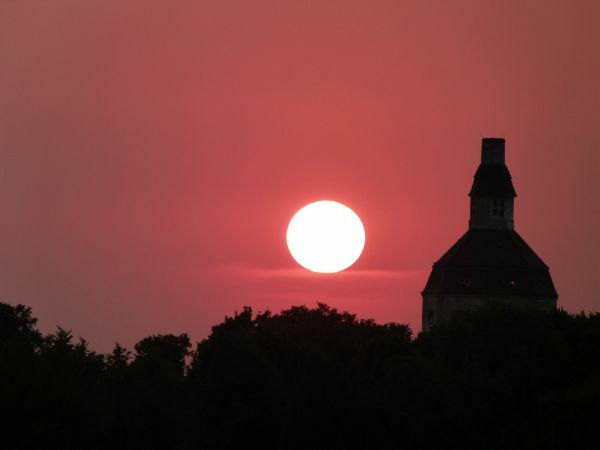 Thanks for this list – I have added lots of your suggestions! We are going to be in Paris mid-June with our 14, 15, and 16 year olds (girl, girl, boy). Any ideas on what we can do with them in the evenings apart from stroll around? TY! I agree, the teens came up with lots of fun ideas for all ages. Happy to have discovered your linky. Thanks for the tips Phoebe! Still dying to get back to Paris to dig in deeper to all there is to do with kids. Yes, the boat would appeal to younger kids too. Thanks Wilbur, my local teens came up with some great ideas didn’t they. I bet you loved the idea that you could get a beer in MacDo! I wonder where the hill was…. I’m so pleased to hear that Alex; I wonder how old your kids are. Hopefully some of these will still be relevant in 10 years time, though I guess the restaurants might have changed! Next time you’ll have to give it a go Catherine! We are a few years away from bringing teenagers to Paris but I enjoy reading posts like these for general ideas. I didn’t realize it was possible to rent an electric self-drive boat. What a fabulous idea! I’m so happy you enjoyed this Erin, thanks for inspiring it. 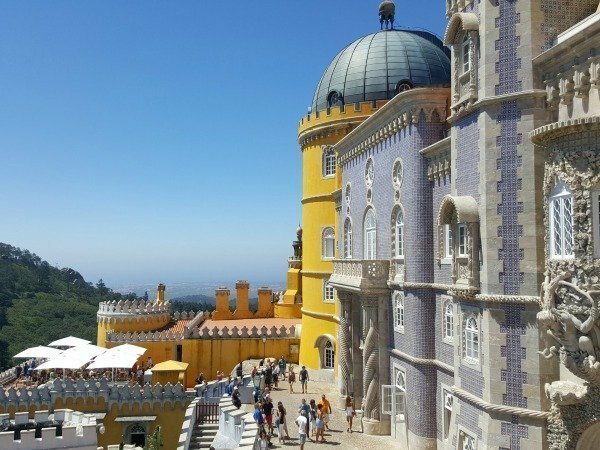 Would you care to add any other ideas fro your recent trip? I agree, thanks Eileen, teen can be just as hard work as toddlers if their own way! I love pretty much most of these idea too, young at heart, eh! Oh you should definitely give it a second chance, Paris is too lovely to write off after only one go. Boats of all descriptions are usually pretty popular with mine too. Haha Kat, it’s probably not a bad idea some days! I love the idea of you as a nerdy teen Clare! Yes and no! France LOVES MacDonalds and I believe it’s the 2nd biggest consumer in the word, so to embrace another US burger chain isn’t so surprising. It’s all part of the French paradox! Great list! I can hardly believe that the biggest Five Guys is in Paris!? It seems so unlikely, so un-France. You’ve got it just right – teens need a mix of things to do and a day of ‘must-sees’ just doesn’t cut it. 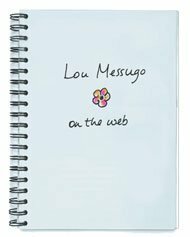 Some fantastic ideas here. I must be a teenager because I love all these ideas. Hee. Paris is so wonderful. After reading this and hearing about Erin’s gallivanting I can’t wait to get there again. Working on my hubby who needs to have some work meetings there soon! I went to Sydney on my first trip away on my own and boy did we get up to some mischief.. I used to love the Friday night rollers, haven’t seen it for a while so I was happy when some of my teens suggested it. We didn’t know what to do with teenagers in Paris. 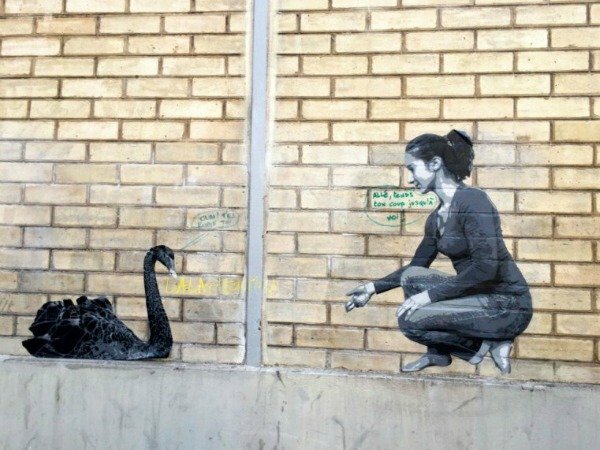 What a pity we hadn’t read this blog. Well blogs didn’t exist then. All sounds very good. I think Paris might have changed since that particular baby was born….a very long time ago! 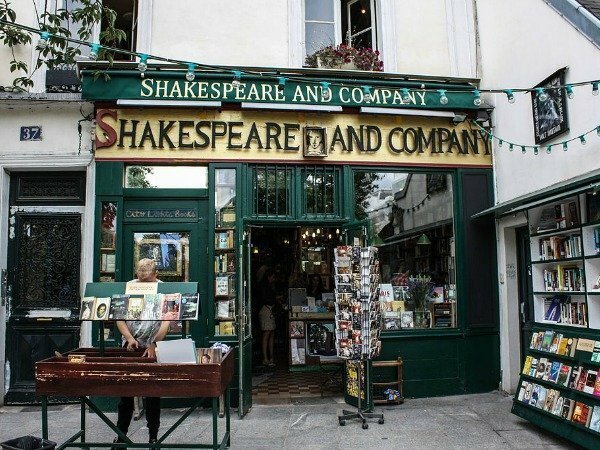 However Deyrolle and Shakespeare & Co were already open back then, did you know about them? I’m happy to hear that Christine, let me know if you try out anything new from this list! That’s great to hear Lolo. Oh yes you will Hilary, Paris can be visited over and over! Sounds like my kind of teenager! Thanks Ruth, I agree with you! I agree that these ideas would appeal to many ages! That’s the hazzard of riding in a big city and I know it’s not for everyone, but I have also known plenty of teens who’ve hired vélib’ bikes and had a great time, safely! I agree that most of these things would appeal to a wider group than just teens, I certainly want to do most! Boom! You hit it completely right! Food, shopping, and doing things….although honestly except for the shopping bit that’s me too. I think every single teenager would love Deyrolles….so interesting! Looks like you’ve come up with some fun ideas. I’d nix the bike tour. Last time we were in Paris we saw the bike tours nearly get picked off by traffic. Fabulous post!! Wish I’d had it before my most recent visit! Guess I’ll just have to come back! This is great Phoebe! Having contributed to this and currently living in Paris with teens, I wasn’t expecting to pick up so many great ideas. Thank you! We lived there too. 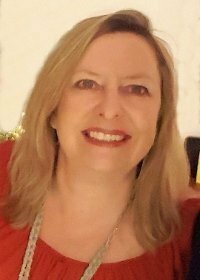 And our first child (well known to readers of this blog) was born there, but as we moved to Brussels when she was only a couple of weeks old, and it was all rather a long time ago, I am unable to offer much, if any, useful advice. These tips however sound good.